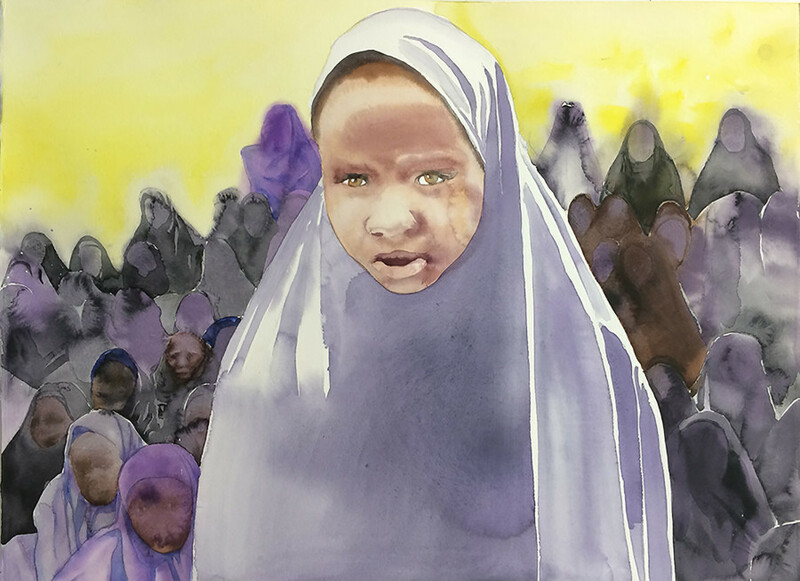 The work addresses three horrific atrocities that plagued girls around the time of the piece's inception: the 276 schoolgirls kidnapped by Boko Haram in Nigeria; the two teens gang raped, murdered and hung from trees in India; and the young women forced into labor at the Magdalene asylums and laundries in Ireland. "These people, when they were alive, weren't treated with any dignity," Cronin states. "Their bodies are gone. The idea then of looking at clothing without bodies inside them seemed to be a poetic, powerful and poignant metaphor." To create her work, the artist sourced hijabs from Africa, saris from India and aprons from the U.K. She then brought all of the materials together under one roof, piled them on the church's altars, and added dramatic spotlights. When she first visited the Chiesa di San Gallo, Cronin was struck by the way the three stone altars mimicked the three horrific stories of women's suffering. Next to each pile she added a small, framed photograph taken during the corresponding tragic event. Curated by Ludovico Pratesi and produced by The Brooklyn Rail Curatorial Projects, the piece took inspiration from artists like Sophie Calle and Bill Viola, who, too, transformed religious places of worship into sites for art. "Hopefully when the people walk into the space they're not walking into a white box gallery," Cronin said. "They know they're walking into a space that speaks about solemnity." Cronin hopes the beauty, reverence and magnitude that often characterize a church atmosphere will contribute to the overall power of the work. "In a church, people are a little bit quieter, they slow down a little bit, which is necessary here. I mean, the numbers that are involved in the horrible things happening to women around the world are staggering. What do you do with the statement 110,000,000 women are missing? That's what Amartya Sen, economist and winner of the Nobel Peace Prize, said in 1990. "What do you do with that number?" 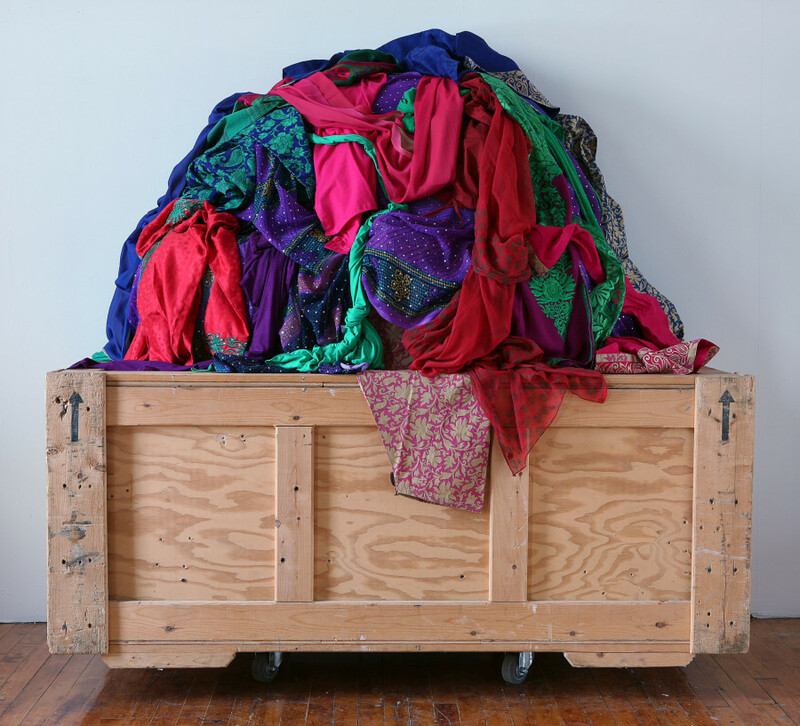 The artist anticipates the visceral jab of empty garments, piled and unworn, will help viewers realize the magnitude of the global crimes that often feel so far away. "They say there's this thing called the 'identifiable victim effect,'" Cronin said. "Which basically says 'one death is a tragedy, 1,000 deaths is just a statistic.' My goal was: how do we get people to focus on what's happening to women and girls around the world? How do I un-numb people, and you and me?" Although the work hasn't yet debuted to the public, visitors to Cronin's studio have reacted with "a range from goosebumps to tears," Cronin said. "As one curator said to me, 'it's a real punch to the stomach.'" Cronin also provides her viewers with easy next steps, ways to get involved with the issues for which she advocates. Text inside the church lists three organizations striving to change girls' futures for the better: one is the Campaign for Female Education (Camfed), which funds women's education and helps girls become leaders in sub-Saharan Africa; another, Gulabi Gang, Cronin describes as a "group of pink, sari-wearing female activists in India"; and then Justice for Magdalenes, an Ireland-based organization that works to ensure survivors of the Magdalene Laundries are acknowledged, protected and never forgotten. Cronin plans to donate 10 percent of any profits from the artistic endeavor to the listed associations. Accompanying the installation, a banner reads "Shrine for Girls" in the 14 most commonly spoken languages around the world, seemingly to sum up the simultaneous accessibility and brutality of the entire shrine itself. As Cronin puts it: "I want people to come to this venue from all over the world, and say, 'Wow, this is speaking to me, too.' But it also says, 'The problem is everywhere.'" 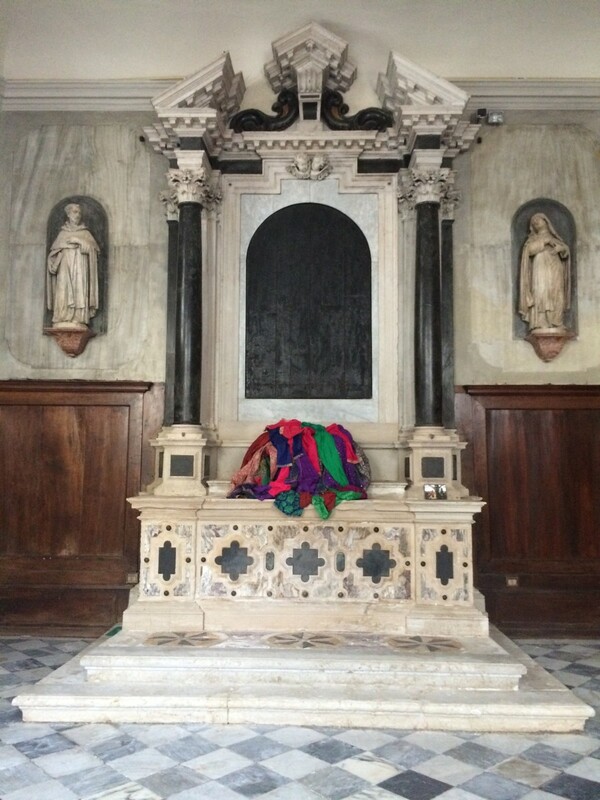 "Shrine for Girls" runs from May 6 until Nov. 22, 2015, at the Chiesa di San Gallo in Venice, as part of the Venice Biennale.